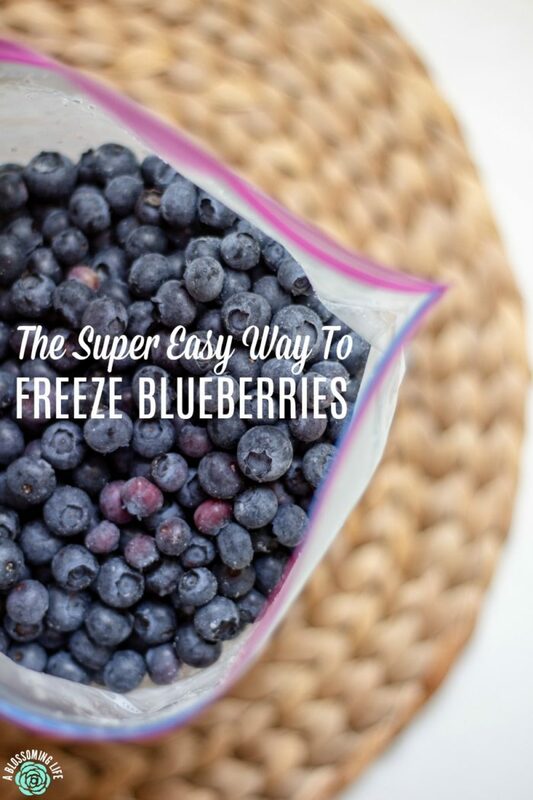 Learn how to freeze blueberries with this super simple tutorial, so you can enjoy them all year long! 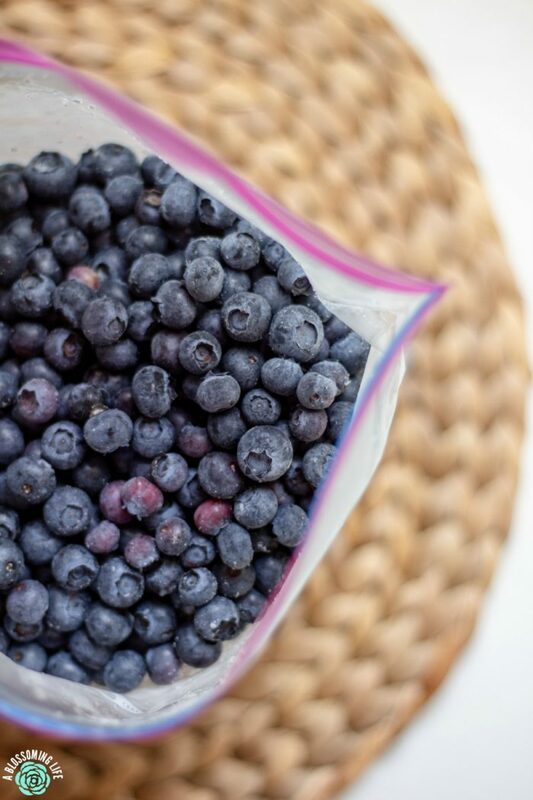 Preserving food doesn’t have to be hard or complicated; follow my tips below when freezing fresh blueberries. Oh, blueberry season. One of my favorite seasons. Not just because the summers here in the Pacific Northwest are amazing, but also because of the amazing food available all summer long. August, my sweet baby girl, turned 3 years old the other day, and she insisted we go blueberry picking. I suggested we go to the park in the morning then blueberry picking in the afternoon, but she insisted that we needed to go before the park. What the birthday girl wants, the birthday girl gets. We went blueberry picking. We tried out a new picking place, and the ladies there were so sweet. They told us we could eat as many as we wanted while we picked! Challenge accepted. August was picking away, meticulously making sure she only picked the plump, dark blueish-purple fruit. I nicely reminded her she could eat some while picking, to which she responded, “no mom, I’m busy picking them!” Well okay, miss mature. Since we don’t live on our own farm (yet), going to a you-pick place for blueberries is the best alternative. You get much cheaper prices than the already picked stuff, and you can pick as many as you want. Our goal this year is to pick and freeze enough for the whole year (about 5 lbs a month), plus have lots of fresh berries. So that means we will try to pick 60 lbs to freeze, then more to eat fresh. Whoa. That is a lot. We will have to go a few times to get them all! The cheapest frozen blueberries I’ve found are from Costco at $3.33 a pound. We can pick them ourselves for $1.50 a pound, saving us $1.83/lb, which comes out to about $110 a year. And that is just the frozen stuff! We will pick much more for pies, too. Plus, picking our own blueberries helps us make fun memories and gives us pride in our food. Preserving food doesn’t require you to have your own farm! You don’t necessarily need a homestead to homestead. You can find other alternatives to create your homesteading dream. Some days, I’m thankful we don’t have a farm yet. 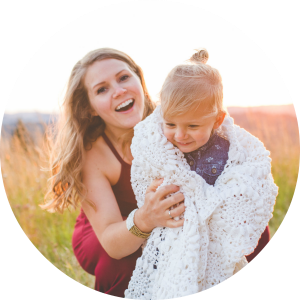 I can’t imagine taking care of land, animals, preserving food, church planting, and running my business (aka this blog) with a toddler and a baby. There are so many people that do (which is awesome! ), but we just can’t be stretched that thin. I know my limitations. So I’m super grateful for time and freezer space to take advantage of the awesome resources around here and make my homestead dreams come true while living in town! 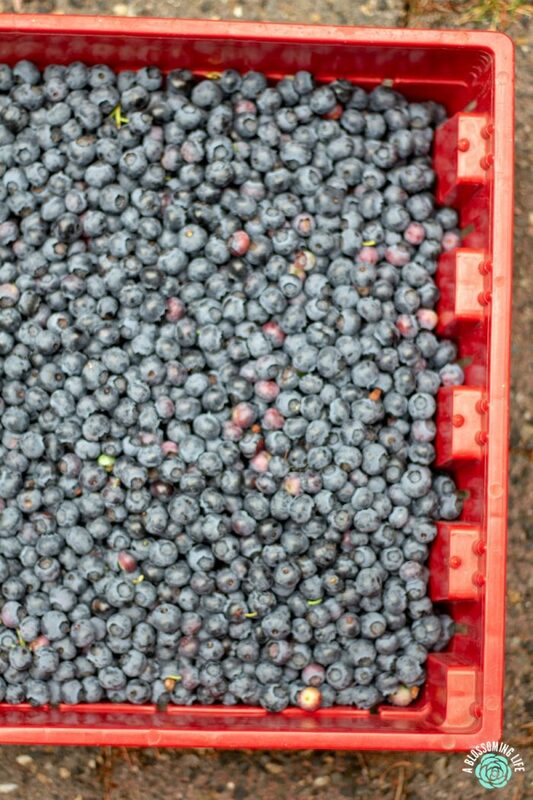 When you freeze fresh blueberries at the peak of ripeness, you help get the most benefit out of the nutrients. Fruits and veggies picked out of season (from different countries and then shipped here), or ones that have been sitting on the grocery store shelves for awhile, start to lose some of their nutrients. Blueberries are awesome because they make an easy and healthy snack anytime. Add them into your favorite recipes’ they’re packed with nutrients and fiber, and they’re low in calories! Make sure your blueberries are dry. If they are wet, they will stick together when freezing. If you don’t have a blueberry farm near you to pick, you could buy them from the store during the summer when prices are cheapest. Purchasing straight from a farm in bulk may also save money. Store them flat in plastic zip-lock bags. 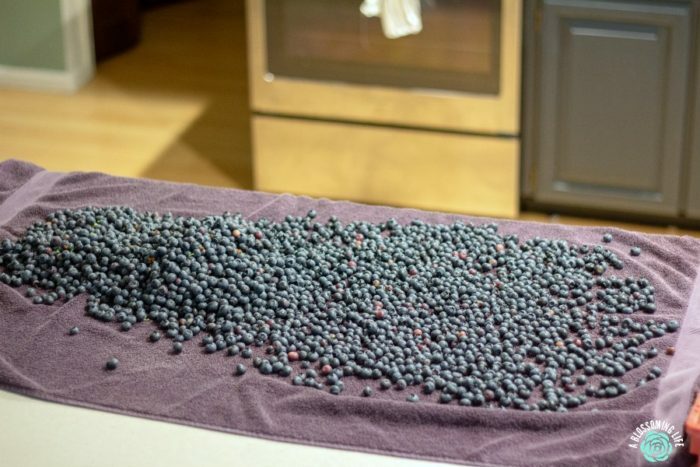 Rinse blueberries with water and lay onto a large towel or cookie sheet. Allow to air dry. 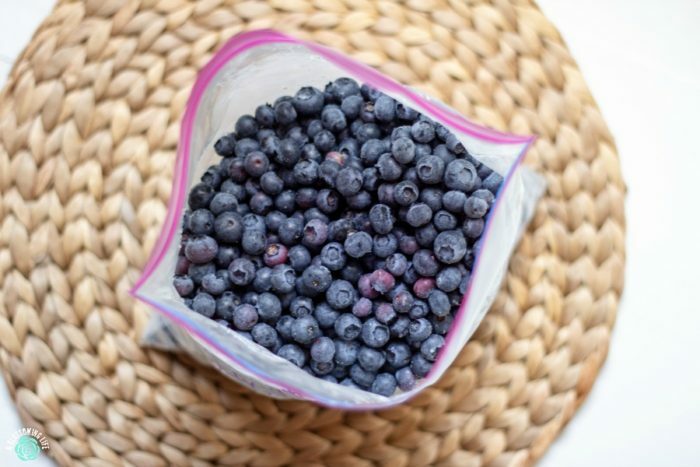 Once dry, transfer blueberries to a storage container or plastic bag. Label and place into the freezer. The frozen blueberries will stay good in the freezer for 10-12 months for top quality. You could also make jam or jellies, can blueberries, or dry them for preservation. I haven’t really ventured into the canning department much, so I’ll stick to this easy way to freeze blueberries. Do you wash blueberries before freezing? Yes, but wash them right before you are about to freeze them. Since blueberries are delicate, they tend to go bad faster once you wash them. How long do blueberries keep in the freezer? Blueberries keep for 10 to 12 months in the freezer for best quality. How do you freeze blueberries without getting mushy? 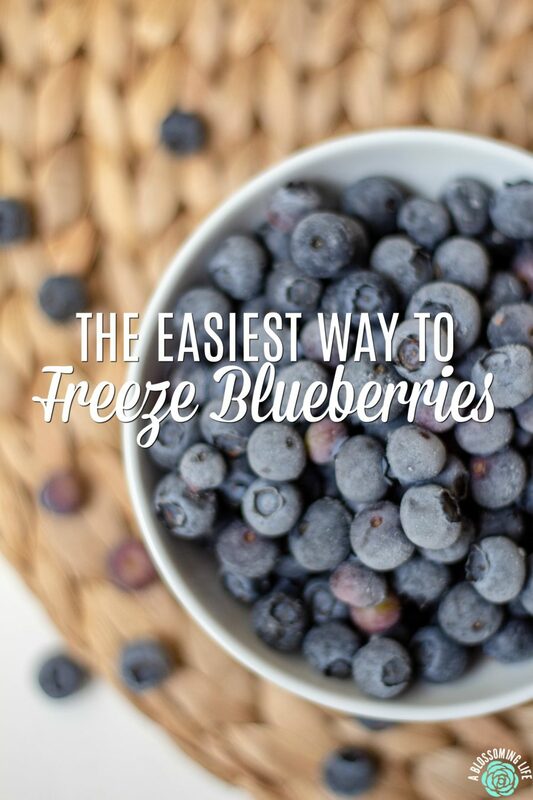 Follow the tutorial on how to freeze blueberries above. You could also dry them, lay them on a cookie sheet and place them in the freezer to freeze flat. I found this unnecessary as long as the blueberries are completely dry before putting them into the plastic bag and then into the freezer. How do you use frozen blueberries? Eat them – we frequently just eat frozen blueberries by themselves. This is my daughter’s favorite before bedtime snack. Top yogurt – plain yogurt with frozen blueberries is seriously yum. Top your breakfast cereal or add into oatmeal. Also works great for overnight oats. Now that you learned how to freeze blueberries, you probably need more blueberry recipes! Check these out! Gluten Free Blueberry Pie is one of our favorite blueberry recipes! Try this refreshing Blueberry Basil Lemonade. Blueberries and basil sound weird together I know, but seriously, it’s kind of magical. During the winter, use your frozen blueberries to make this Blueberry Dutch Baby. Blueberry Lemon Cheesecake Ice Cream Sandwiches are so good! Did I mention no churn and a GF option? Now on to the next thing to pick… hmmm peaches? Or grapes! Our new house has a grape vine, and I’m hopeful we will be able to put away a lot of delicious grapes in the freezer this year also. Have you tried to freeze blueberries before?